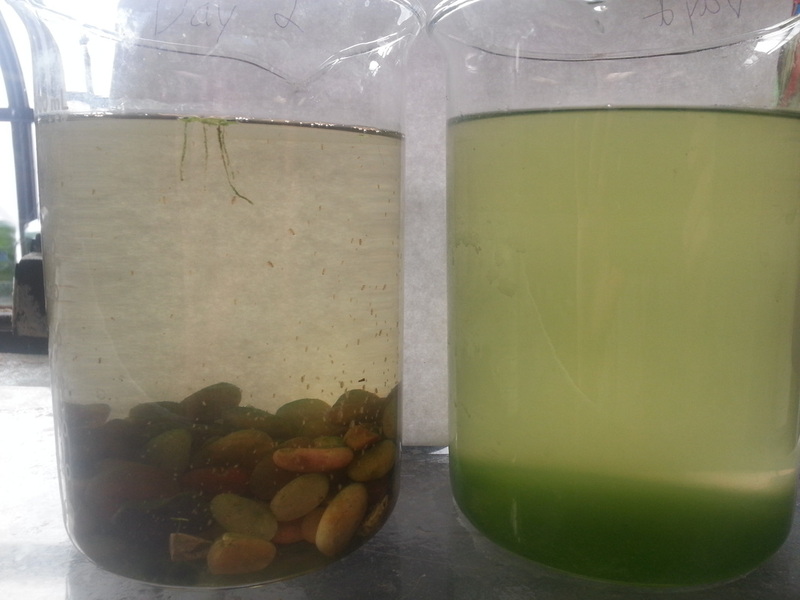 This is our first trial with daphnia in green water. What daphnia do is that they eat the green water. The first time we did a experiment with the daphnia, we didn't know how they work. After this experiment, we learn that the more Daphnia the faster the water clears. 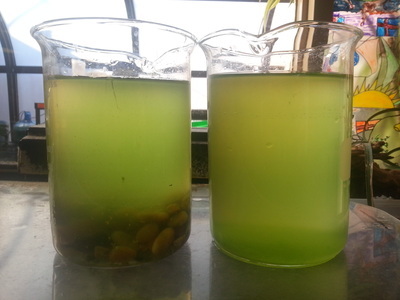 But what we didn't notice is that we put in Pregnant Daphnia's in the bottles so they reproduced. In order for them to survive, we need green water. Daphnia are commonly called "water fleas" because of their style of swimming which resembles the movements of fleas. On average Daphnia are 1–5 millimeters in length (0.04–0.20 inches) and ones' overall lifespan is aprx. 50 days. There are over 200 species of Daphnia in the whole world and the kind we are using is the Magna Daphnia. Daphnia eat micro-algae which is basically the algae at it’s source. Daphnia are a key factor (along with Amphipod) in our project however the amount of Daphnia we currently have is low. Daphnia’s body are transparent and you can see organs from the outside. We started doing this experiment because the original material we used for the chinampa didn't work out and the other material we wanted was too expensive. We wanted to use something that anyone, anywhere would be able to obtain and build at low cost. We got a regular plastic container and put our cultured green water in it. Then Kimberly (a former member) took 48 daphnia and placed them in the container. Day one! Look closely into the container.... do you see anything? Can believe 48 Daphnia are swimming around in there. After a weekend the daphnia died. This has never happened before, and we think it's because the PVC glue was not completely dry and it mixed with the water and killed the daphnia. One of members from the team are putting in the new chinampa. What's different about this testing is that there is no net. so we call it a "garbage chinampa" because it looks similar to a garbage can. As you can see in this image (to the left), there are daphnia and amphipods eating the bacteria of the crayfish that sadly died. May it rest in peace. Recent update....there is nothing left but the exoskeleton of the crayfish! The amphipods consumed everything! This is the pink pool on September 5th, 2014 when we put it in it obviously didn't have algae water but it was clear water. 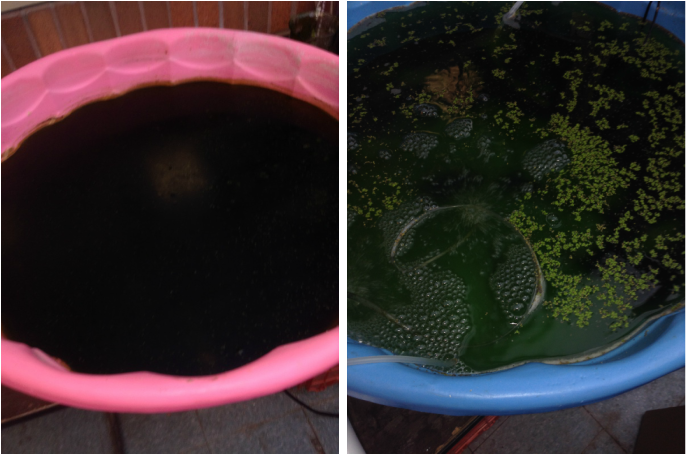 On September the 10th when we looked at it our pink pool of algae that didn't held daphnia and wasn't airated and it turned out like this. At this point of time we started aerating it and added a chinampa that you will see below soon. 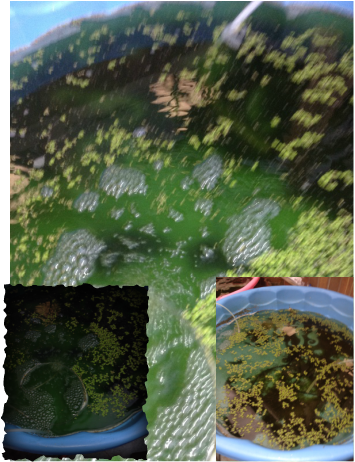 We want to determine if Daphnia can survive and remove algae from this potentially toxic pool of algae! Stay posted for results! This is our blue pool when we first started again it was a clear pool like it is on the bottom right corner. We put both pools on the same day and checked the same day. However we aerated this pool and placed our LAST culture of Daphnia in. When I checked on the 10th it was like how it is on the bottom left corner. After I check a week on the 17th it became clear like how we placed it on the 5th. The bottom right photo is the outcome of the hard work of our Daphnia! 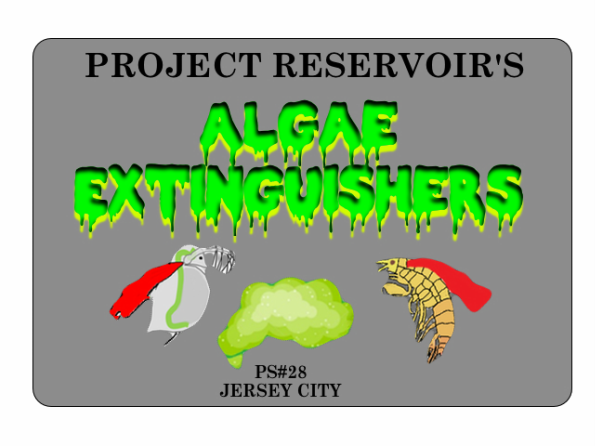 We have, and will continue to prove that Daphnia can and will remove microalgae from freshwater systems!